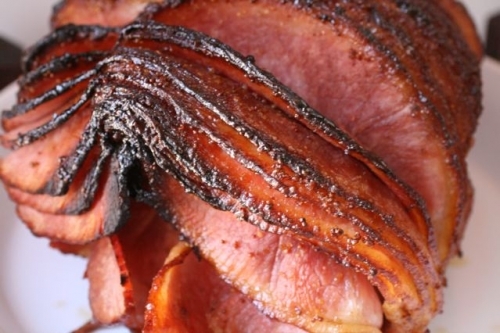 Learn how to cook a ham the easy way. This is an easy recipe for beginning cooks serving a large family meal. 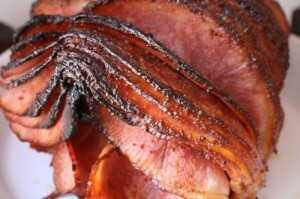 Buy a whole ham and cut into slices about one-half inch thick. Place the slices of ham in a baking dish in a fan design. Mix one cup of water and 1/2 cup of brown sugar. Pour over the ham slices and cover with foil. Let it sit while you turn on the oven to 375 degrees to preheat. Once the oven is preheated, place the ham in the oven. While the ham is cooking, make a pot of mashed potatoes and one pot of sweet carrots. The ham will need to cook for one full hour before you check it. If it is not done leave it in for another 15 minutes and check again. When it is done, serve with the mashed potatoes and carrots as a full and tasty meal. This is one of my very favorite meals. Can I suggest you also make a creamy chicken flavored white sauce for the mashed potatoes. I love making the basic sauce (1/2 cup flour, 1/2 cup margarine melted to a bubbling roux, then adding 3 cups milk or a little more) adding about a TBLS of Sam’s Club Chicken Base to give it an excellent flavor. The gravy this makes is my sons very favorite. He used to live close enough to come home regularly for this tasty Sunday meal.